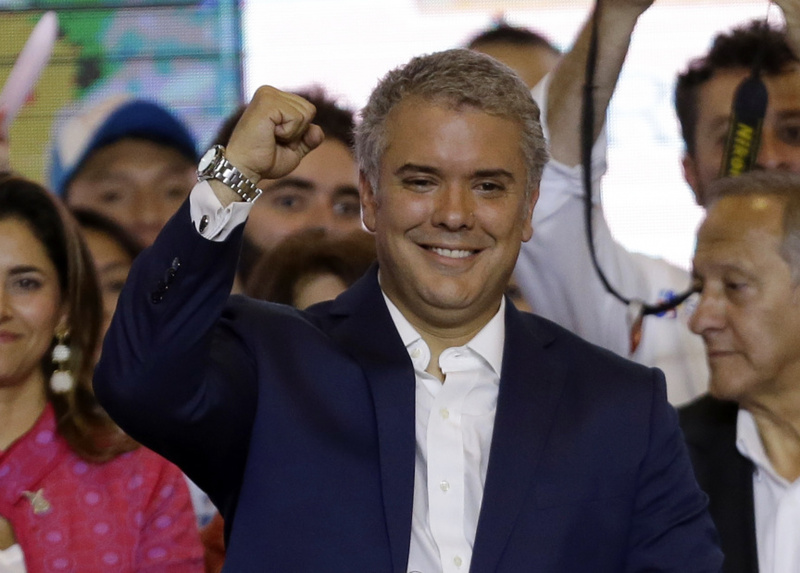 The conservative Duque, the protege of a powerful former president, was elected Sunday with 54 percent of the vote. He finished more than 12 points ahead of former guerrilla Gustavo Petro, though the runner-up's performance at the ballot box was the best ever for the left in one of Latin America's most conservative nations. "This is the opportunity that we have been waiting for — to turn the page on the politics of polarization, insults and venom," Duque told jubilant supporters Sunday night, joined by his young family. Duque's promise to heal the scars from five decades of bloody conflict will demand a quick response. The FARC rebels who demobilized under the accord are struggling to reinsert themselves into civilian life in a nation where many people are hesitant to forgive. Vast swaths of remote territory remain under the control of violent drug mafias and residual rebel bands. Petro energized young voters and drew millions to public plazas with fiery speeches vowing to improve the lives of poor Colombians long neglected by the political elite. His more than 8 million votes marked the biggest success for a leftist presidential contender ever in Colombia, where politicians on the left have long been stigmatized because of the civil conflict. Petro took his loss in stride, refusing to call it a defeat. In a concession speech that at times sounded celebratory, he challenged Duque to break with his hard-line allies, and Uribe in particular. He also promised to mobilize his considerable following into a combative opposition that will fight for social reforms and defend the peace accord.